As much as I love my Das Ultimate Silent keyboard, the one thing that it fails to do is live up to it’s “silent” label. Whilst it’s certainly massively quieter than something like the mighty IBM Model M, it still makes a fair bit of noise due to the keycaps bottoming out when typing, making a plastic clacking noise. With a new more squished up office layout at work my colleagues have been begging threatening bribing cursing complaining requesting that I consider the “O-Ring Mod”, where you remove all the keycaps and install little rubber rings underneath each key to reduce their noise. The result is quite effective, about a 50% sound reduction IMHO, with little negative impact on the typing experience – just a slightly shorter travel distance and a bit more bounce in the keyboard. There’s a great Youtube video on the difference it makes with various Cherry MX switch types – my Das Keyboard uses the brown switches, which are the second type demonstrated. There’s a number of online stores happy to sell you the rings – although in my case, I just ordered the raw thing from Amazon than a keyboard shop. 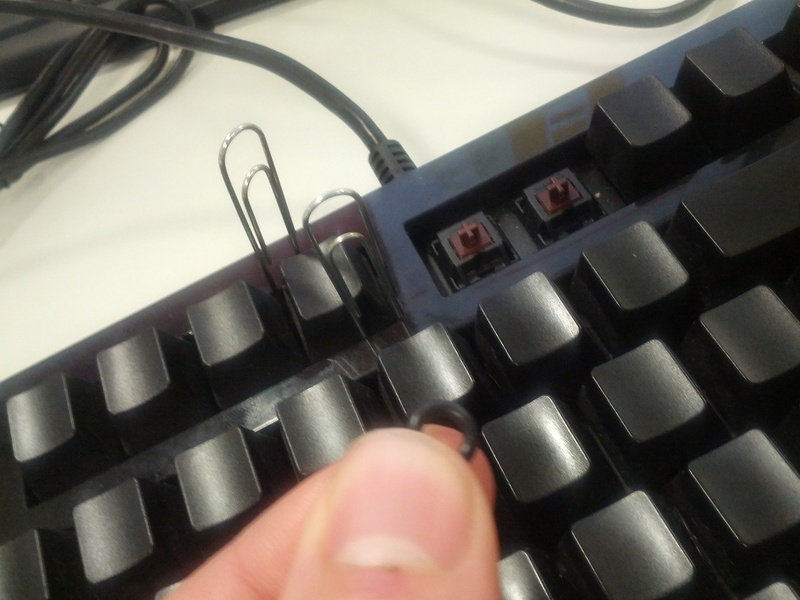 I also decided against spending the $10 for a keycap remover which was a good move – a couple paperclips were effective enough. Generally the replacement was easy, the biggest issue was the spreader/stabiliser bar keys, such as the Enter, Backspace, Shift and Space keys – these ones have a little metal bar which you need to stretch apart to unhook the key from and to hook it back on once the rubber ring is installed. 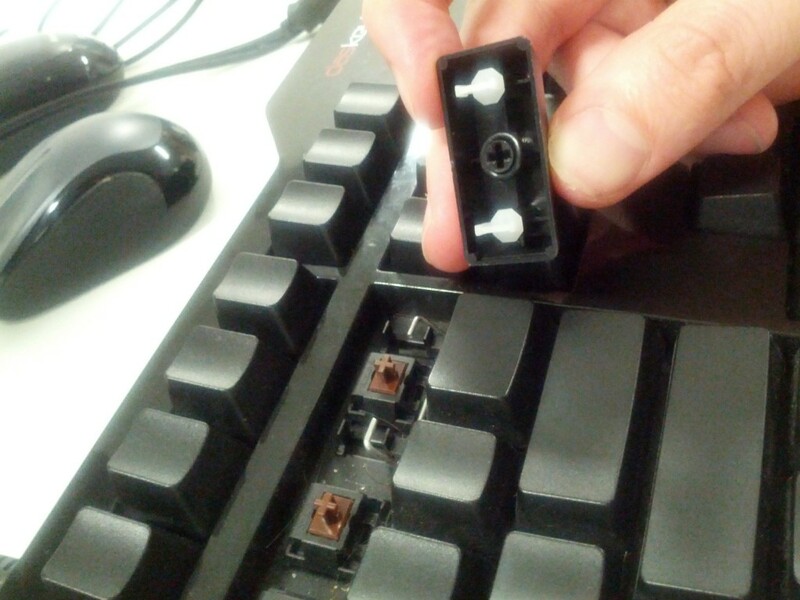 The tricky keys – don’t just pull them off, unless you want to break the white plastic loops. You can see the little rubber ring I’ve just added to the keycap. Next up is working to improve my typing accuracy – I can already thrash out some insanely fast stuff, but my accuracy rate can vary a lot (partially due to bad spelling), but sitting down and forcing myself to slow slightly for more accuracy would be a good trade off. I’m also pondering learning a different layout like Dvorak which could be a good excuse to learn a new typing style and get some performance advantages. This entry was posted in Uncategorized and tagged das keyboard, dvorak, geek, hacks, hardware, ibm model m, o-ring, qwerty, rubber, speed, typing. Bookmark the permalink.